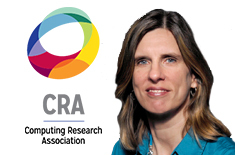 Mary Hall was recently appointed as ACM’s representative to serve on the Computing Research Association (CRA) Board of Directors. Hall’s three-year term on will begin July 1, 2015. The CRA is an association of more than 200 North American academic departments of computer science, computer engineering, and related fields; laboratories and centers in industry, government, and academia engaging in basic computing research; and affiliated professional societies. The CRA’s mission is to strengthen research and advanced education in the computing fields, expand opportunities for women and minorities, and improve public and policymaker understanding of the importance of computing and computing research in our society. The CRA Board of Directors are a distinguished group of leaders in computing research from academia and industry. The board is elected by CRA’s member organizations. (Source: www.cra.org).